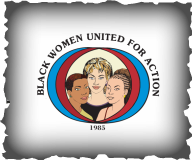 Black Women United for Action (BWUFA) envisions a community service, volunteer, non-profit organization which values empowering vulnerable families by providing programs and support services. It will be distinctive in serving communities, especially those considered "at-risk" with low-income residents. The identity of BWUFA will be framed by a commitment to advocate for women and provide the building blocks for youth to achieve their potential. BWUFA will be a collaborative organization distinguished by a diverse membership and partnerships with businesses and other community organizations in order to fulfill its mission.